This year we commemorate the Centenary of the Battle of the Somme in World War One, but as more and more military veterans from World War Two leave us, you might be forgiven for thinking that the whole subject of Remembrance might pass from the public consciousness. And yet each year, the Remembrance season heralds an ever more hectic period of activity for the Allied Air Forces Memorial and Yorkshire Air Museum as we work to “keep their memory alive”. On November 6th, we attended our unique annual memorial event for the two Yorkshire French squadrons at the Cathedral of Saint Louis at Les Invalides in central Paris. This majestic location is home to the tomb of Napoleon and was established by Louis XIV as a home and hospital for injured and sick soldiers. Along with our friends of Les Groupes Lourds, French Air Force Association, we were proud to attend this ceremony when each year, the famous French aircrews of 346 and 347 Squadrons are remembered with great affection in the capital of their homeland. Returning to the UK, on November 10th, museum staff travelled back to London to meet once again with a contingent from Groupes Lourds, plus French Embassy and diplomatic representatives and other French organisations based in Britain, at a special ceremony initiated, in remembrance of the RAF and Armée de l’Air. They laid wreaths on the evening of 10th November at the Bomber Command Memorial, Green Park, London, before a special Anglo/French event at the Royal Air force Club. The following morning, Armistice Day, all gathered once more at the French Memorial at Brookwood Cemetery in Surrey, and in the afternoon at the Marchal Foch National Memorial in Central London during a busy schedule. 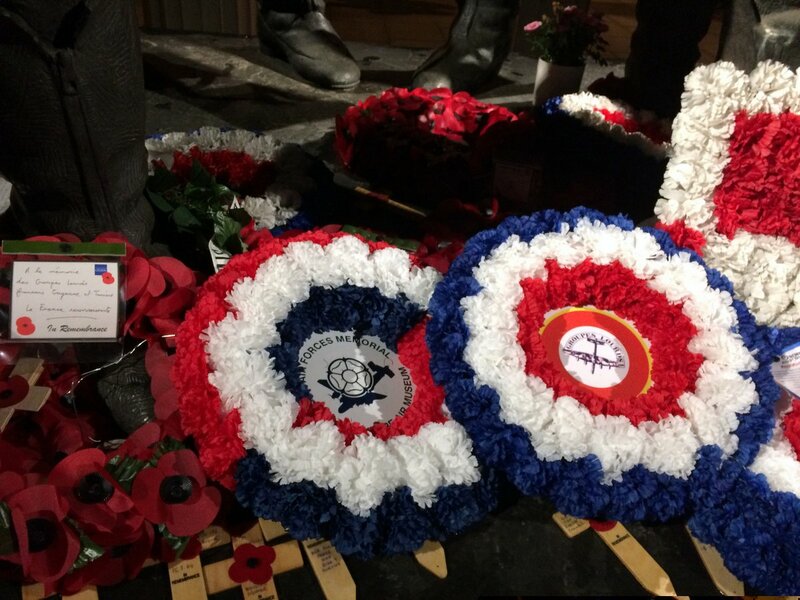 This year the unique new “Allied Air Forces Memorial & Yorkshire Air Museum” wreath, made to reflect Allied, French and British colours, and produced by the Poppy Factory in Richmond, Surrey, was laid. In these uncertain times, it is very heartening to see the continuing public affection for the act of Remembrance and additionally, the new youthful faces who take the time to learn and understand the sacrifices of those who went before them. The Allied Air Forces Memorial continues to work to remember those who gave their lives and to remind others just how easily the world can descend into global conflict. Let us all hope that in these Remembrance ceremonies, we all learn from history and avoid the mistakes of the past.